Toy commercials going above and beyond what the actual toy was capable of was all the rage in the 80s and early 90s. You almost expected it. How else could they get us to buy their lame products? We needed the jingle. We needed the animation. We needed this commercial to make us want to lose our minds with the sheer awesomeness that this toy could bring to our lives. Crossfire did that, and more. It took a simple game and threw it into an arena, where the boys wore leather jackets, the crowd was cheering them on, the lightning was flashing, and fire was raging out of control in the background. Add a badass rock and roll tune that would make Stan Bush lose it and you had us sold. WE NEEDED TO GET CAUGHT UP IN THE CROSSFIRE! It’s a prime example of marketing working its magic on us. The BEST part about Crossfire wasn’t the game itself, it was the song we would all eventually start singing while playing the game. 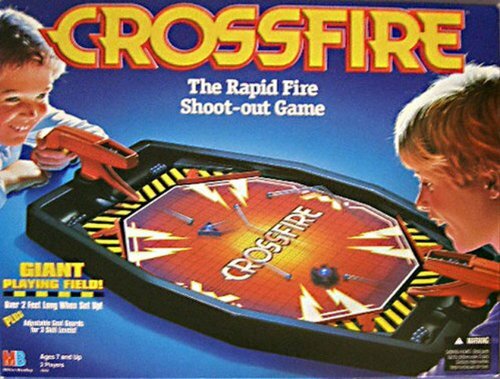 In all honesty Crossfire was rather lame, and the fun factor would last for about 10 minutes due to the cheap design. The toy company knew it, and so they amped it up to Nth degree with its toy commercial. We all still get excited whenever we hear about Crossfire, not for the actual game play factor, but because of the badass commercial that is forever etched into our young impressionable minds.